If you want to bowl like the guy in the video you gotta practice, practice and more practice. So start tonight and Time Out NY has a survey of New York City Bowling Lanes to help you decide where to begin your quest for Bowling excellence. On Saturday afternoon, take a fun boat trip to Staten Island 0n the Ferry and then visit the nearby Staten Island Museum for the Staten Island Ferry - A History book talk and signing with author Patricia M. Salmon. Or take the Roosevelt Island Tram and celebrate Women's History Month in the afternoon and an evening of Mozart. Somehow even after months, maybe even years, of coast-to-coast, blogger-to-foodie adoration, bacon hasn’t jumped the shark yet. On Sunday at Radegast beer hall in Williamsburg, Brooklyn, reap the rewards of the Bacon Takedown, in which 30 competitors offer an array of porcine dishes. A $10 fee gets you a sample of everything; expect lines. I've had their hot sausage and it was great! On Roosevelt Island this weekend, the Farmers Market will be open as usual on Saturday as is Gallery RIVAA, the Roosevelt Island Visual Arts Association which is exhibiting a new group show titled Vernissage 8. 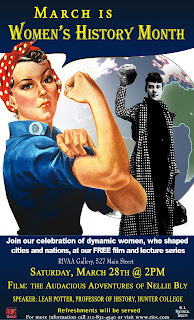 Roosevelt Island is celebrating Women's History Month on Saturday afternoon at the Gallery RIVAA with the showing of the film Around The World in 72 days, a biography of daring 19th Century investigative reporter Nellie Bly. Later that evening (8 PM) attend an All Mozart free classical music program presented as part of the Rosemarie & Robin Russell Family Concert Series at the Good Shepherd Community Center. Also, RIOC has produced a great self guided tour map (PDF File) of Roosevelt Island for any visitor or resident looking to stroll the Island and learn something more about it. Check out some other ideas on what to do in New York City this weekend from Free NYC, the NY Times Urban Eye and Spare Times, and Newyorkology. The RIOC Board this morning tabled recommendations from the Common Council of the Roosevelt Island Residents Association on awards from a $100,000 Public Purpose Fund. The RIOC Board had, for the second year, delegated the allotment of the funds to the residents organization. RIOC Board member Fay Christian initially asked for the tabling, then withdrew the motion, requesting that the RIRA recommendations be rejected, but another Board member, Patrick Stewart, also moved for tabling. The vote was 5-4. During the discussion, RIRA President Frank Farance told RIOC Board members that the RIRA subcommittee of four that produced the recommendation, which was approved near-unanimously by the Common Council, had followed RIOC guidelines. Christian objected that The Child School was passed over on a request for something just under $6,000 in funding, rejecting RIRA's explanation that The Child School serves few Island residents. Stewart suggested there had been a conflict of interest in the awards. That contention received the backing of Sara Seiden and Mandi Ridler of the Roosevelt Island Day Nursery. Ridler said that a representative of Island Kids, Nikki Leopold, had been present when she made a presentation to the RIRA subcommittee, and that her questioning seemed to suggest she was a member of the subcommittee. Farance said she was not, and named the four members. During discussions at the RIRA Common Council meeting earlier this month, one explanation for favoring Island Kids, with a $36,000 award (the full amount requested), over the Day Nursery, which requested $35,000 but received only $4,000, was that more Island children would be served by support of the Island Kids program. Christian also objected to the non-award to Orphans International, which had requested $15,000. During the discussion, Stewart proposed that his RIOC Operations Committee meet soon -- as early as next week -- to consider the matter further, but there was no final resolution of how further decision-making will be scheduled. Farance had made the point that several organizations slated to received funding under the RIRA allocation need information quickly on whether their programs can proceed. 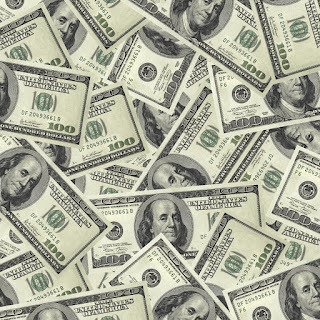 Additional information on the Public Purpose Funds program and the RIRA recommendation is available in the March 7 and March 21 issues of The Main Street WIRE. The members of the Board voted 5-4 to table. How RIOC, acting by and through the Board will proceed is not presently known to me and will be at the call of the Chair of the Governance and Ops Cttee. The web cast of the 3/27 RIOC Board Meeting is not yet available but when it is will be here. I will have more on this later as will the Main Street WIRE's next issue. UPDATE - 3/29 - According to RIOC there will be a meeting of the Board of Directors Governance Committee on March 31 to discuss and review the Roosevelt Island Public Purpose Funding. PLEASE TAKE NOTICE that a meeting of the Governance Advisory Committee of the RIOC Board of Directors will be held on Tuesday, March 31, 2009 at 4:00 p.m. at the RIOC administrative office, 591 Main Street, Roosevelt Island, New York. The committee will discuss and review the Public Purpose Funds and Public Purpose Funds procedures. 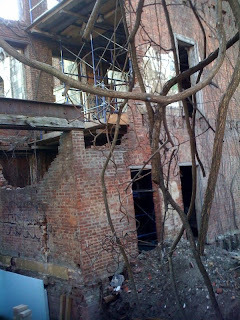 ...Renwick Ruin: Work continues with a completion date projected for early spring. Final steel installation to take place early in April. But in the meantime some people cannot resist the urge to trespass (explore?) inside the Renwick Ruins which can result in injury to themselves or others. Aided- Two males injured, fell threw floor or Ruins, transported to hospital. Trespass- Four male subjects arrested for trespass in the Ruins. Two officers injured while apprehending subjects. The two people who fell through the floor at the Ruins and were hurt were Public Safety Officers who were pursuing the fleeing subjects, who do not reside on Roosevelt Island. 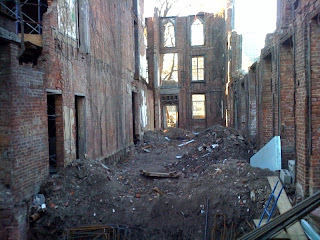 Here's a brief look inside the Renwick Ruins from 2006. 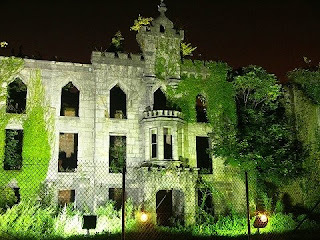 A more detailed You Tube visit inside the Renwick Ruin was here but has been removed. 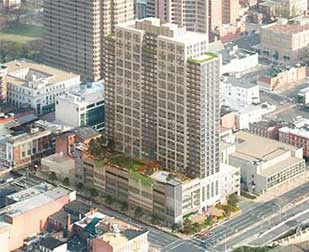 His proposal — a 32-story apartment tower with high-efficiency green features, parking for train commuters and a bike shop and bike storage area — won the city’s approval. When finished, the 500-unit tower will be the city’s second-tallest building after the Connecticut Financial Center and, eventually, its largest taxpaying structure. Right now, it is the most visible sign of downtown New Haven’s continuing appeal to private investors, even in the midst of a prolonged downturn. While many large-scale developers are pulling back as they wait for the credit markets to ease up, Mr. Becker is moving his $180 million project along so fast that it is ahead of schedule. Roosevelt Island 360 forwards the following message he received from the MTA regarding disruptions to Roosevelt Island F Train service for the next two weeks. Please be advised that due to emergency work, there will be no northbound F service at Roosevelt Island on weeknights from 12:01 AM - 5AM, March 26th to April 10th. We apologize for any inconvenience thismay cause. Northbound service means Queens bound trains. ... per MTA website: The service changes to the F Line described below, between 3/26 and 4/10, are only in effect on Tuesdays through Fridays Midnight through 5:am. 179 St-bound "F Trains" trains run on the "V Line" from 47-50 Sts to Queens Plaza Late night. For service from Manhattan to Roosevelt Island and 21 St-Queensbridge, take the "F Train" to Roosevelt Av and transfer to a Coney Island-bound "F Train" . Roosevelt Island 360 speculated yesterday that the "S"Posters plastered all over Roosevelt Island the last few days indicated that the Angelina Jolie movie Salt was being filmed on the Island. He is right. Salt has been filming on Roosevelt Island at Coler-Goldwater Hospital the past couple of days as confirmed to me by one of the crew members and this notice from the 3/24 On Location Vacations. 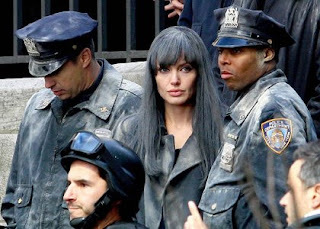 The crew member said that no outdoor filming was being done but only interior shots at Coler and that Angelina Jolie made an appearance on the set. Several members of the security staff for the Salt Production crew were not very happy with me taking any pictures near Coler Goldwater Hospital and strongly encouraged me to move along even though I was walking on a public street and there was not much going on. Rescue Me and Life on Mars. 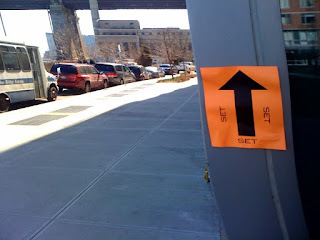 Here's some more information on movies and television programs filmed on Roosevelt Island as well how to get your Roosevelt Island Film and photography permits. The next RIRA Town Hall meeting will be on Wednesday, March 25, at 8-9:30PM at the Church of the Good Shepherd -- upper floor. (1) Discussion of agenda items on the March 26 RIOC Board meeting agenda. (2) Discussion of results from the February 19 RIOC Board meeting. If I receive questions in advance, I will forward them to you as soon as I receive them. As always, thank you, your staff, and your directors for participating in the Town Hall meetings. RIRA President Farance and the RIRA Budget Analysis Committee had some questions regarding RIOC's proposed budget as stated here. I received the following message from the good folks at R & R Concerts. 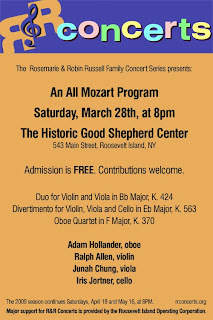 The first event of the 2009 Rosemarie & Robin Russel Family Concert Series - An All Mozart Program - will be held this Saturday night, March 28, at the Good Shepherd Center. Admission is FREE. Contributions welcome. "...the program choices are great, the performers energetic and the space is great for chamber music." 3 viewers betw ages 20 to 59. "Wonderful music and musicians. It's rare to hear string trios; that was a real treat. I like the balance of Baroque, classical and contemporary pieces. Church acoustics were just right - not too echoey for the selection they played. And it was free! Great turn out; great flyers; great musicians! Thank you!!". From 2 visitors from New Jersey ages 20 to 59. "This event is comparable to a performance at Carnegie Hall or Lincoln Center! Thank you for sharing such a wonderful concert with our community." From 3 local people betw ages 0 to 59. The late Rosemarie and Robin Russell together organized numerous concerts and events on Roosevelt Island; they wanted to encourage music education and appreciation. Robin spoke about organizing a concert series which would bring music to Roosevelt Island on a regular basis. 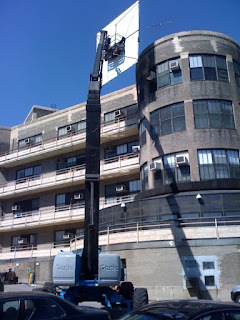 After Rosemarie passed away, Robin continued their mission on Roosevelt Island and founded the Island Arts Music School. He established programs with the new Roosevelt Island communities at Southtown and Octagon. He had just started Musikids, a music and dance experience class for toddlers. Music was the catalyst and the reward. Robin was the director, secretary, accountant and one of the teachers at the school. Robin died unexpectedly in February, 2007, leaving our community at a tremendous loss. Women's History Month On Roosevelt Island Celebrates Jounalist Nellie Blye - From Lunatic Asylum To Around The World In 72 Days! Received the following information from RIOC and the Roosevelt Island Historical Society concerning the celebration of Women's History Month on Roosevelt Island. ... Around the World in 72 Days is an acclaimed biography of Nellie Bly, a daring investigative reporter. The movie presents her initial fame in revealing conditions in the 19th century New York City Lunatic Asylum (later known as Metropolitan Hospital and now the site of The Octagon). The film also focuses on her effort in 1887 to travel around the world in an attempt to beat the schedule of Jules Verne’s 1873 novel, Around the World in 80 Days. 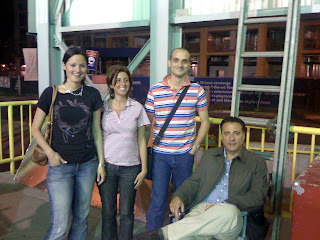 Sponsored by The Roosevelt Island Operating Corporation (RIOC), in partnership with The Roosevelt Island Historical Society, the film will be introduced by Leah Potter, who works at the American Social History Project/Center for Media and Learning at the CUNY Graduate Center, and is a specialist on Bly’s work and life. Around the World in 72 Days will be shown FREE on Saturday, March 28 at 2:00 p.m. at RIVAA Gallery at 527 Main Street; all are welcome. Refreshments will be served. More on Nellie Bly's experience at the Octagon Asylum in Ten Days In A Madhouse from the Disability Museum, a Voice of America radio program and the Nellie Bly song by Stephen Foster. Also, the 3/21/09 Main Street WIRE on Nellie Bly. 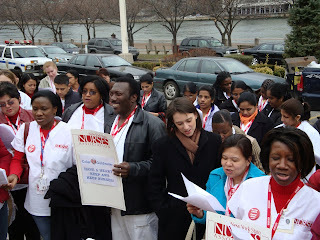 ... the New York State Nurses Association held a protest in front of both the Coler and Goldwater hospitals, at which Council Member Jessica Lappin and I joined the nurses in their opposition to management’s decision to force them to move to a five-day schedule, instead of continuing to offer a choice between a five-day and four-day schedule. This decision does not serve the long-term interests of the hospital and it is unfair to its staff. Two years ago, introducing the option of a four-day week attracted many new nurses to Coler-Goldwater despite the state’s nursing shortage. To reverse this labor policy will undoubtedly drive many of these nurses away from the hospital. This is especially true during a hiring freeze and will result in an unacceptable situation for both staff and patients. Roosevelt Island 360 has Council Member Lappin's statement on the Coler-Goldwater rally protesting the elimination of alternative work schedules for Coler-Goldwater nurses. If you are interested in volunteering at Coler-Goldwater Hospital, the Angelica Patient Assistance Program may be for you. More on volunteering at Coler-Goldwater with the Angelica Patient Assistance Program. OIWW is now initiating a program to assist Roosevelt Island residents with workshops teaching job skills and internship opportunities for students. OIWW sent the following message explaining the program. HS Community service is free. Helping Island residents gain the skills they need for today’s job market. Taught by the interns, volunteers and friends of OIWW. "High School Community Service credit at OIWW" Yes, high school students can conveniently do their community service hours here on Roosevelt Island. Come learn what work is available and what skills teens will learn. We are open for scheduled after school hours and certain Saturday Mornings. Our present High School student volunteers will present the OIWW opportunities for Sophomores and Juniors. Come learn what work we have and skills we teach at OIWW. Using Constant Contact, Stephanie Liu will guide you as you build your own newsletter. 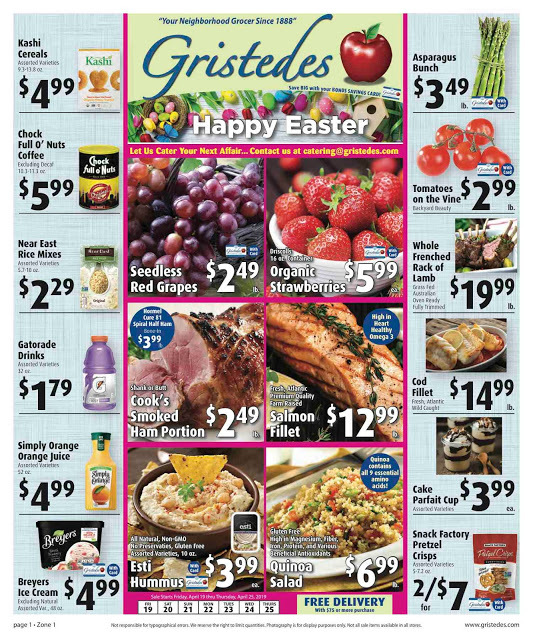 "Making beautiful e-marketing newsletters...fast" OIWW uses Constant Contact to design elaborate and fun to read =newsletter and e-brochures. Bring your laptop computer or use ours, our talented interns will show you how to design a piece just for your family or your favorite charity. 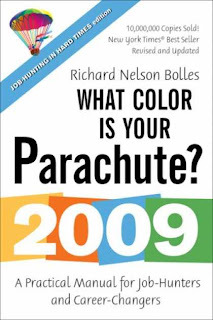 You will receive advanced information of what to bring to the class. 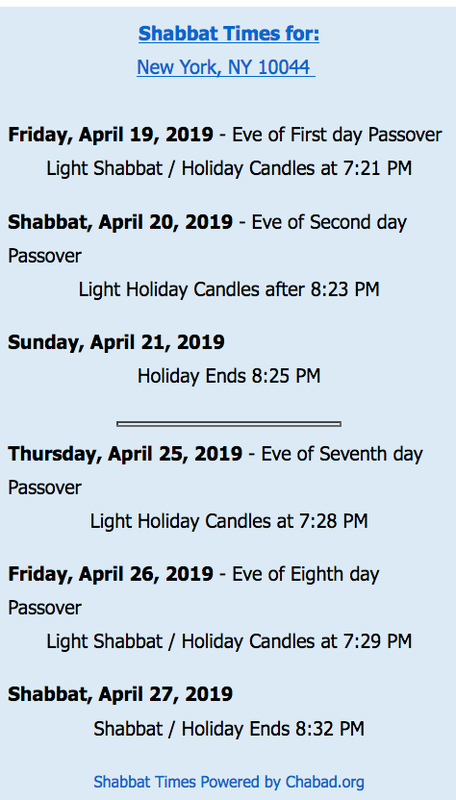 E-mail Linda@oiww.org to receive your instructions of what to bring to class. Come learn how HS Sophomores and Juniors can complete their community service on RI. Personal questions and advice will be offered after the program. 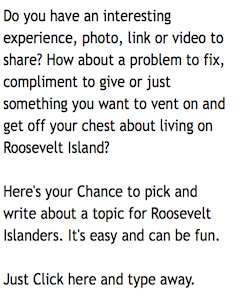 High School Sophomores and Juniors can complete their community service on RI. Breaking through the crowd takes skill. Getting meetings takes ability. Outlasting your competition takes a special knack. Ultimately how you handle yourself determines whether or not you get the offer. Learn techniques that will add to your competitive edge. Hone your job search with the most up to date strategies, techniques, and methods developed by the Five O’Clock Club, America’s Premier Career Coaching and Outplacement Resource. Harriet Katz has a Doctorate in Social Work, is certified by The Five O’Clock Club as a Career Coach, by the Association for Psychological Type International in the Myers Briggs Assessment (MBTI), and by The Centre For High Performance in leadership behaviors and development (UK). She has been a therapist, an Associate Professor at Yeshiva University, and Director of the Wiener Management Center at UJA-Federation. Over the past decade, she has been a Career and Personal Coach. Do you wish you could find things on-line? Find information about a company where you are applying for a job? Use Google better? Get the answers you are looking for? Elena Carasca is a professional researcher. 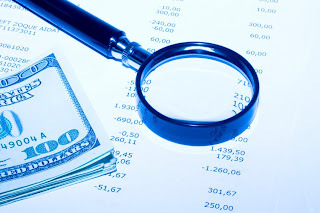 She helps not for profits find information on foundations, donors, corporations and private businesses. She will reveal where she finds FREE information that will give you confidence when you go for interviews. "The one who knows the most gets the most"... come learn to do on line research. "Using Salesforce.com for database work"
This is one of the hottest "cloud computing" programs in the world of business and OIWW has it for their volunteers to use and train on. Come get a taste of how data entry is done on Salesforce so that when you interview you can say "I am familiar with Salesforce". Talented OIWW volunteers will train you.
" NYS Jobs search sites"
Come get the basics about where the job listings are. And we will also discuss sites like Craig’s list, the Foundation Center, Monster.com and agencies. HR professionals will make some suggestions you may not have heard about. With less jobs listed, you need to work harder and smarter to find work today. Paris Hilton has one (or two) and everyone needs one. Come learn how your skills might make you perfect for becoming a personal assistant to a busy executive. Linda Stanley, OIWW Ex. Dir., has worked as a free lance assistant to lawyers, professors and senior citizens. She will show you how to present your job skills so clients will be thrilled to have you as their PA.
OIWW’s mission is to ensure the physical survival of the orphaned children we serve, to help them reach their potential, learn to appreciate diversity, and develop a capacity for leadership. Through a small-home, family centered approach, OIWW helps children in need become healthy, contributing members of their local communities and happy citizens of the world. 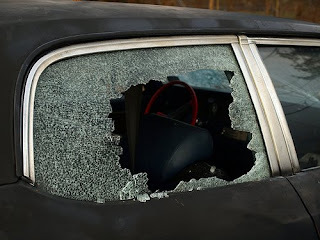 559 Main Street, New York, N.Y. 10044 U.S.A.
Criminal Mischief- Vehicle passenger side window smashed, G.P.S. only item missing, NYPD on scene. Roosevelt Island Public Safety Director Keith Guerra provides some additional information on incident. The vehicle that had its window broken and portable GPS stolen was parked in the Motorgate. Thieves often seize the opportunity to break into cars which have a portable GPS system in plain view (usually on the windshield). Please reiterate to your readers the importance of removing these portable GPS systems from the windshield and either taking them with them or securing them in the trunk. It is also wise to wipe the circle left on the glass from the GPS system to hide the fact that they have one. Mr. Guerra also advises that the Public Safety Department has new temporary headquarters. Please be advised that the RIOC Public Safety Department has been temporarily relocated to 504 Main Street, while the old headquarters is renovated. 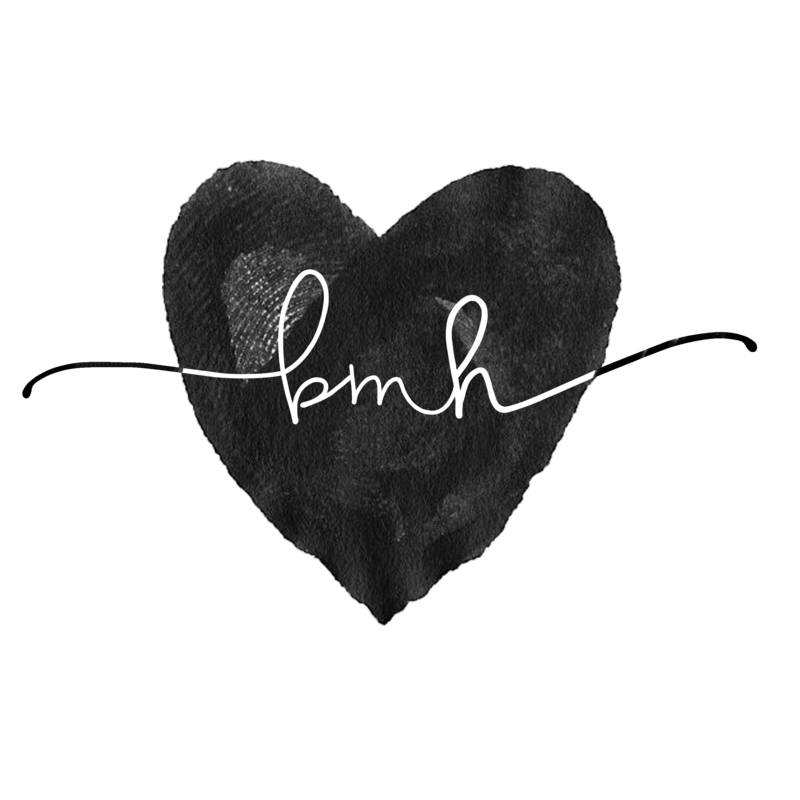 The phone number is still 212-832-4545. Construction is slated to commence on Monday, March 23rd and will be completed in approximately 4 months. We have temporarily secured 3 parking spaces opposite 504 Main Street for our marked Patrol cars. Reservation of the 3 spaces opposite 552 Main Street is needed for authorized Construction vehicles so that traffic on Main Street will not be compromised. Again, this is temporary and should not inconvenience the residents of the island too much. We remain at your service. 2/16/2009 888 Main St Two residents were performing a Craigslist business transaction. This was a violation of policy. Due to the size of the item it cannot be moved without an appointment. Tenant and resident were advised of this and the condition was corrected. 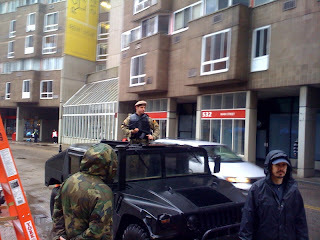 2/17/2009 R/O 645 Main St NYPD officer notified PSD to report victim who was assaulted by 9 black males. Victim was walking home when one subject asked for the time and then proceeded to punch him in the face. Victim ran home and notified 911. The February Monthly Statistics for type of incident and location are here as well.